I mean, does it get any better than avocado for breakfast? I thought avocado toast was the be-all and end-all. But then I went to The Nile and got their inspired version and my life was never the same. So Husband, being the amazing overachiever he is, had to make his own at home. And YAASSSS, y’all. SO good. So I did what I do and made my GF version as a breakfast sandwich. Thank the heavens above for Kite Hill cream cheese and homemade English muffins. No, seriously. This sandwich is bomb. And this post isn’t sponsored by Kite Hill or anything, but I’m officially hooked on their cream cheese. I’m open to trying others, but I have zero problems buying this one again. Nom, y’all. NOM. It really levels up avocado toast! 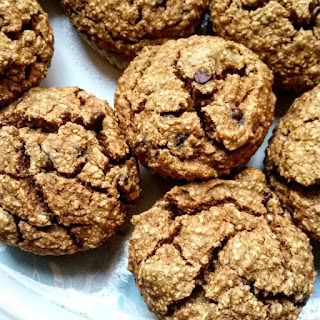 So if you’re like me and love breakfast, check out my other recipes like Breakfast Cookies, Apple Pie Smoothie, Gluten-Free Chocolate Donuts, Golden Milk Latte Cookies, Blueberry Muffins, Oatmeal Breakfast Bars, or any of the bazillion Baked Oatmeal recipes (like French Toast, Cherry Pie, Peanut Butter Apple, Cookie Dough, and Piña Colada). A delicious and easy-to-make breakfast sandwich with avocado, cream cheese, tomato, and cashew parm. All on a homemade English muffin. GF + V! Preheat oven to 350 degrees F (176 C) and prepare a ramekin with parchment paper or a small spray of oil. Add oats, chia seeds, and baking powder to a small food processor or grinder like a Magic Bullet and grind into a flour. Put oat flour in a small bowl and mix applesauce and water with it to create a dough. Put dough into ramekin and smooth the top of it so it's flat. Then bake for 18 minutes or until the top is slightly golden brown and firm when pressed. Let cool for 15 minutes and then slice and toast while you slice your avocado and tomato. Spread cream cheese on both slices. Then add avocado, tomato, and seasoning/cashew parmesan (plus any optional toppings like seeds) to one slice and top with the other. Enjoy! Best when fresh. *English muffins (originally from The Big Man's World) can be made ahead and refrigerated until ready to use. They're good in the fridge up to 5 days. I have not yet tried freezing them, but I will and report back. If you do, let us know how it goes! **Cashew Parmesan recipe. Add 1/4 tsp onion powder as well. This Doggy Cookie Dough recipe came about when I was making the Doggy Peanut Butter Fudge. In fact, I’m not gonna lie: It’s the same three ingredients in the same measurements. It’s just not formed into bites, so it’s even easier. It looks like cookie dough and tastes a little like it (just less sweet). Your dogs will love it nonetheless though, so let’s get to it, shall we? This apple pie smoothie, y’all. There’s something about it that’s super comforting. It reminds me of happiness and a simple way of life. It’s sweet and perfectly spiced, and though it’d be better in the fall, I’m all about bring fall to me right now (like we did with the Baked Apple Cider Oatmeal). So let’s go make this delicious smoothie! Mine’s green because I add greens, but you don’t have to. Starting with a base of bananas is a good idea though. Then we add all the other amazing ingredients, like apple, dates (for sweetness though optional), cinnamon, nutmeg, walnuts, oats, and flax/chia. You can even include maca or turmeric (+ black pepper for more turmeric bioavailability) for an even healthier drink! I really can’t get enough of this one. I’ve made it before, but it was time to make it again – and boy, am I glad I did! It’s refreshing but comforting right now as summer continues to heat up my part of my world. Cheers to you if you make one! I dig smoothies, so if you do too, check out our other smoothie recipes: Pumpkin Pie, Blueberry Pie, Chocolate, Tropical Green, Chocolate Golden Milk, and Pineapple Mango Grapefruit Smoothie. A smooth, sweet, creamy, and perfectly spiced apple pie smoothie perfect for breakfast on a fast-paced morning. Throw in the blender and go! Add all ingredients to blender one by one. Then blend until smooth and well combined. Pour into glass and enjoy. Store leftovers covered in refrigerator for up to 48 hours, though best when fresh. Clearly, I love golden milk. I make lattes, cookies, hot chocolate, smoothies… I can’t quit it. I don’t want to. So, today, we’re making a baked golden milk oatmeal to feed the obsession. I mean, when it’s healthy for you, is it really that wrong? Nope. I think not. So let’s do this! This one starts out like all the rest: banana. But there’s no water needed this time because we’re using some of our golden milk latte instead. I haven’t quite figured out the right way to spice it yet without using part of the GML batch, but that’s probably because I nearly always have some GML in the fridge, waiting to be warmed up. So I’ll work on that. For now, behold! It has that rich golden milk flavor, but it’s also sweet and comforting. The warmth from the spices matches the heat of the oatmeal once it’s been baked, and the walnuts on top give it a perfect texture combo, IMO. I’m really loving this flavor – and I look forward to making a chocolate version with the Hot Chocolate Golden Milk Latte recipe, which you can easily do with this! If you love golden milk as much as I do, check out my other GML recipes: Golden Milk Latte Cookies, Chocolate Golden Milk Smoothie, Hot Chocolate Golden Milk Latte, and the quintessential Golden Milk Latte. But I also have a TON of baked oatmeal recipes you’ll want to try too: Blueberry Pie, French Toast, Chocolate Zucchini, Baked Apple Cider Oatmeal, Cherry Pie, Peanut Butter Apple, and more found right here. 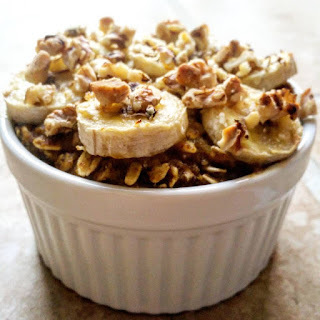 A sweet, perfectly spiced baked golden milk oatmeal wonderful for a healthy, warm breakfast. Naturally sweetened and super delicious! Mash banana in small/medium mixing bowl. Add golden milk latte, zucchini, and (optional) maple syrup and stir well to combine. Add flax/chia and oats and stir again. You can add (some or all of the) walnuts here and stir or wait until the next step. Put mixture in ramekin and top with walnuts. Then bake for 20 minutes and let cool slightly before enjoying. *You can use fresh banana or frozen-thawed banana. I've done both and they both work well.